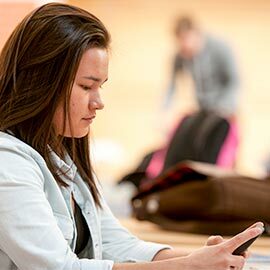 Wilfrid Laurier University has launched a new mobile safety application, SAFEHawk, which features campus-specific emergency contacts at all Laurier locations, personal support resources, safety tips, new feeds, and accessibility information. SAFEHawk is available for free download on iPhone, Android and Blackberry devices. The app incorporates click-to-call functionality, immediately connecting users with campus support services such as the Special Constable Service and the Wellness Centre. Off-campus resources such as police services, Good2Talk and Here24/7 can also be reached via click-to-call features. SAFEHawk has a flashlight function, loud alarm and the ability to send the user’s location to Laurier’s Special Constable Service. “The safety and security of all students, staff and faculty is our priority at Laurier,” said Tammy Lee, associate director of Laurier’s Special Constable Service (SCS). Reach Special Constable Service and local police services. Receive alerts about campus safety issues in real time. Connect with personal and academic support resources on campus and in the community. Notify the Special Constable Service of suspicious activity. Report outages to accessible building features. Lee and staff from the SCS will be promoting the app to students at the SCS booth as part of the O-week Get Involved Fair on Laurier’s Waterloo campus Sept. 10. SCS staff at Laurier’s Brantford campus will promote the app during the Info Fair on Sept. 11. Students who show that they have downloaded the app will be entered in campus-specific draws for a variety of prizes. The mobile safety app committee, which worked to develop the app, hopes that SAFEHawk will encourage users to be proactive about their personal safety and well being by providing them with tools to connect with campus and community supports if needed. SAFEHawk complements Laurier’s existing emergency notification system (ENS), by sending out important security updates as they occur. Questions regarding SAFEHawk can be directed to the Special Constable Service at specialconstableservice@wlu.ca.